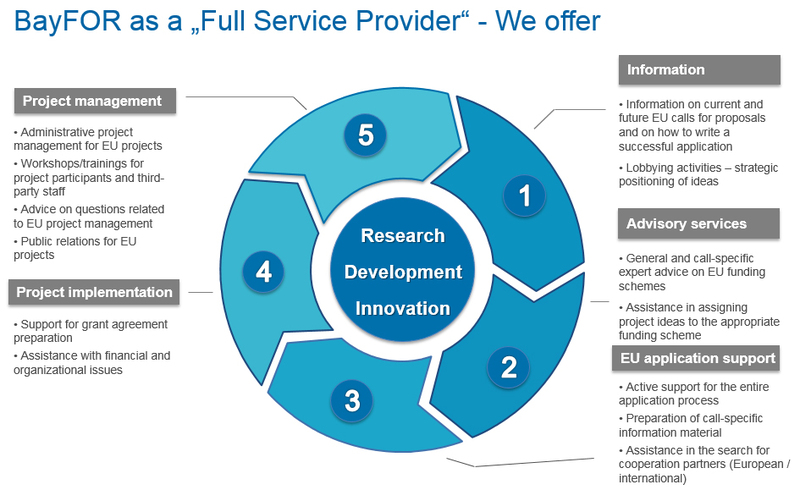 The Bavarian Research Alliance GmbH (BayFOR) is a private company whose purpose is to support Bavaria as a centre for science and innovation within the European Research Area. It was set up at the end of 2006 on the initiative of the Bavarian universities and universities of applied sciences to strengthen their networking at regional, national and international level and help them prepare to meet the requirements for European research funding. To achieve this, BayFOR supports and advises Bavarian scientists and private sector stakeholders in the competition for regional, national and European research, development and innovation funding. The focus is directed at the Framework Programme for Research and Innovation “Horizon 2020”. As a partner in the network for SMEs “Enterprise Europe Network”, BayFOR provides specific advice for SMEs which are interested in EU research and innovation projects. BayFOR is a partner institution in the Bavarian Research and Innovation Agency (www.research-innovation-bavaria.de) and is supported by the Bavarian State Ministry of Science and the Arts. For further information please visit www.bayfor.org/english.